In my never-ending quest to make my family’s diet less about commercial processed foods and more about wholesome ingredients, I make sourdough bread…without commercial yeast (yup, you read that right). I received the sourdough starter (descended from a batch more than a century old) for Mother’s Day, 2016, and after trial (and lots of errors), I’m now pretty good at making an extra-tangy sourdough bread. Sourdough starter is basically flour and water and a colony of wild yeast that needs to be fed, nurtured, cuddled, sung lullabies…you know, babied (ok maybe not quite that last bit…much). To feed sourdough starter, each week you first have to take out some (known as unfed sourdough starter or discard) before adding more flour and water to the crock. If you don’t discard some, you’ll eventually have “the starter that ate Cincinnati” as the crock overflows (especially if, like me, you don’t bake bread every day). I hate to waste anything, so I have to figure out how to use that unfed sourdough starter…in other words, time for sourdough starter discard decisions. Great, you’re back! So, back to the discard. If I take out a cup of unfed starter each week, that’s 8 oz, or 4 oz of flour and 4 oz of water. All I have to do is find a recipe that uses at least that much flour and water, replace those amounts in the recipe, and bake it. And boy have I gotten creative…savory uses are obvious like rosemary focaccia (like the one I paired with Glenmorangie Bacalta scotch in Fancy Finishes and a Chance to Pair), bannocks, biscuits, pizza dough, but (believe it or not) there are sweet uses, too! I’ve made chocolate cake, spice bread, coffee cake, and molasses gingerbread cake, just to name a few (if the flavor is strong enough, the mild sourness is covered up). Luckily, Pinterest has many recipes using unfed starter, so I’m generally not at a loss for ideas (more often I’m at a loss for time!). One day I was at home with my starter (we’re very close), and I came across a recipe for Sourdough Pretzels on King Arthur Flour (one of my favorite baking sites). Since it called for unfed starter discard, I knew I had to try it. I did adapt the recipe for what ingredients I had on hand and some differences in method, so my adjustments are noted in italics. Homemade pretzels, fresh, warm from the oven…mmmmmm…(wiping away drool)…away we go! Mix and knead the dough ingredients — by hand, mixer, or bread machine — to make a cohesive, fairly smooth dough. It should be slightly sticky; if it seems dry, knead in an additional tablespoon or two of water. Cover the dough and let it rest for 45 minutes. It will rise minimally. Towards the end of the rising time, preheat the oven to 350°F (I baked the pretzels at 400°F for a shorter time). Turn the dough out onto a lightly greased work surface, fold it over a few times to gently deflate it, then divide it into 12 pieces, each weighing about 2 1/4 to 2 1/2 ounces. 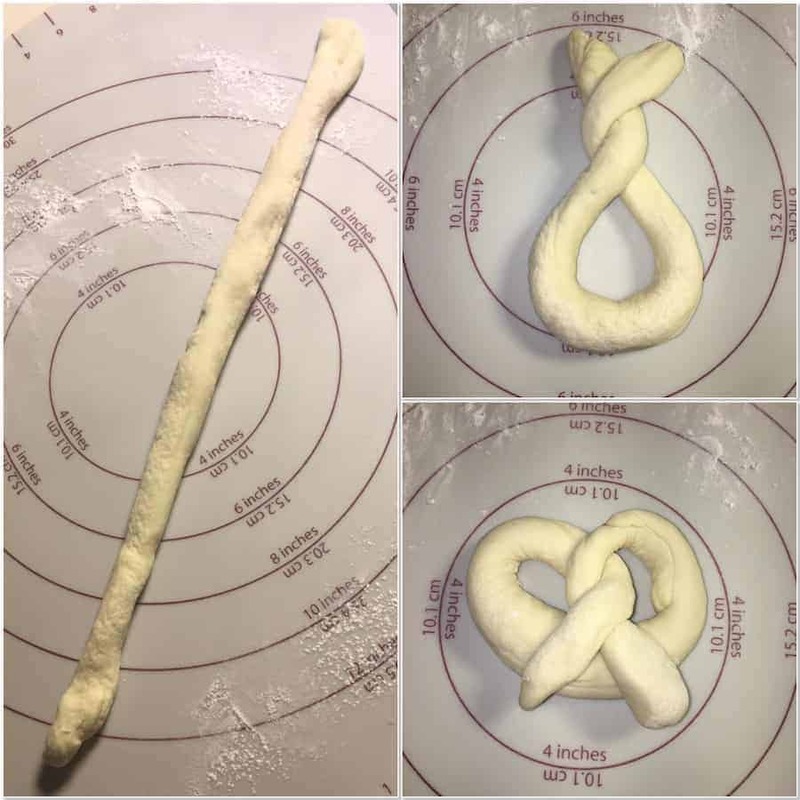 Roll each piece of dough into an 18" rope. Shape each rope into a pretzel. Bake the pretzels for 25 to 30 minutes (at the higher temp, bake for 12-15 minutes), until they're a light golden brown. Note: This is correct; there's no need to let the shaped pretzels rise before baking. Instead of nonfat dry milk (which I don't keep on hand), I substituted ¾ cup (6 oz) of fresh milk, scalded & cooled, and omitted the water. These pretzels were mind-blowingly good…chewy on the outside, soft on the inside, with just of hint of sourness to add interest. Served with a little mustard on the side, these bits of pretzel goodness were the perfect snack for a recent rainy day afternoon. Amid all the unfed sourdough starter use choices I have each week, sourdough pretzels will definitely be repeated!